Have a question on QX50? QX50 is available in 7 different colors - Graphite Shadow, Hagane Blue, Majestic White, Black Obsdian, Liquid Platinum, Malbec Black and Midnight Garnet. Watch latest video reviews of Infiniti QX50 to know about its interiors, exteriors, performance, mileage and more. 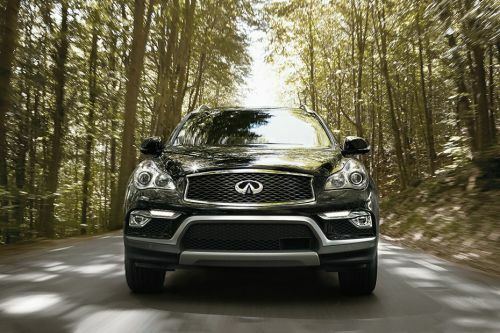 There are very few manufacturers which have the experience of making crossovers as vast as Infiniti. The European manufacturer has come up with a host of crossovers in the past, which have made us realize how a blend of a hatch and an SUV could still look luxurious and feel practical. Out of its lineup, it is the QX50 which is the most popular and has been there for a long time now. Infiniti has recently launched the updated version of QX50 in the local market. It is the updated version of the second-generation model which was launched in 2017. Locking its horns against the likes of Audi Q5, BMW X3, and Jaguar F-Pace, it will be interesting to see how the changes made to the 2018 QX50 will impact its sales. So, without a much ado, here is what QX50 has to offer. On the inside, the Infiniti QX50 gives you mixed feelings – while the overall interior feels plush and luxurious in terms of quality, it is the layout and design which feels slightly drab and boring. One does get a choice of three interior colors (Wheat Leather, Chestnut Leather and Graphite Leather) and two interior trims (Black Lacquer and aluminium and Maple accents). The three-spoke steering wheel, though coming with buttons for audio, Bluetooth and cruise control, looks dated, and so is the instrument console behind the wheel. The centre console, even though looks plush and premium, seems as if it belongs to the r of previous generation. The sloping down center console, which is fully finished in wood, gets a large touchscreen infotainment system with horizontally laid out old-school fashioned controls for the music system. The buttons for climate control look a bit outdated as well, and so are the shapes for AC vents. However, this does not mean that the QX50 lacks in terms of features and equipment. The midsize crossover gets some really nice features such as active front headrests, sunroof, custom leather seats, powered reach and rake adjustments for the steering wheel with memory function, nicely styled and positioned analog clock in the center console, 8-way powered and heated front seats with memory function for driver’s seat, powered folding rear seats, rear AC vents, dual zone climate control and an 11-speaker BOSE music system. When it comes to space, the Infiniti QX50 offers you adequate levels of space at both front and rear. All the Infiniti models have received some major changes in terms of design, but not the QX50. The crossover looks smart, but somehow old-school in front of its competitors and even some of its siblings from the same Infiniti family, such as the QX30. The familiar open mouth Infiniti family grille is present on the QX50 as well, however, it isn’t as sharply designed as on its stablemates. The sweptback headlamp design is large, but looks slightly older, thanks to the absence of modern LED lighting. The front bumper, however, looks slightly modern with large silver skid plates and sleek design for the fog lamps. From the side too, the QX50 is nowhere as dramatic as other Infiniti models, and looks slightly bland, despite a couple of mild curves flowing through the sides. However, the large 19-inch alloy wheels along with black cladding all around the SUV and roof rails give it a much needed bulky stance. At the rear, things start getting slightly better. The QX50 gets LED tail lamps and sloping windshield which gives it an aerodynamic stance. Also, the silver skid plates on the rear bumper are large and along with the dual exhaust ports, they do give the QX50 a rugged and sporty stance. As sophisticated as it is, the Infiniti QX50 gets a nicely done independent double wishbone with coil springs over shock absorbers with stabiliser bar at the front. The rear, on the other hand, gets independent, multi-link with coil springs over shock absorbers with stabiliser bar. Given its premium crossover characteristics, the overall ride quality has been tuned on a softer side to make it feel plush and planted in all conditions. The ventilated disc brakes setup at both the ends feel nice and progressive in action. Like most of the Infiniti offerings, the QX50 too comes with just one engine option, which is a 3.7-litre V6 petrol-powered mill. This engine spins out a maximum power output of 326 bhp and a maximum torque output of 361 Nm. The engine feels refined and powerful, with the overall power delivery being linear and exhilarating only when required. The engine is paired to a 7-speed conventional torque converter. Given its old-school appeal and design, it is quite obvious that the Infiniti QX50 lacks many of the modern electronic safety aids and features which are now taken for granted in a vehicle of this price. The Infiniti QX50 feels quite basic with just the presence of six airbags, ABS with EBD, and reverse camera with around view monitor. It is high time that the QX50 too comes with all the modern safety aids which are surprisingly even available in lower-priced Infiniti QX30. In this day and age when growth in technologies is really fast, the Infiniti QX50 feels archaic, as if it is stuck in the last century. Make no mistake, the Infiniti QX50 is one really luxurious vehicle, with a plush and spacious cabin inside. However, that’s the only thing which is special in this vehicle, as apart from fit and finish and quality levels, there is nothing to talk much about this midsize crossover. The overall design looks dated, the interiors feel largely old school and the list of features, especially in the safety department, is lacking. However, the comfort levels and performance from the creamy V6 engine is praiseworthy. All in all, if you really are out for a luxury midsize crossover and can compromise modernity over just a single factor of premium feel, you can look out for the Infiniti QX50. However, that option is not too sensible. What is the price of Infiniti QX50? On road prices of Infiniti QX50 3.7L Luxury in is costs at AED171,000 . What are the colors options available in Infiniti QX50?